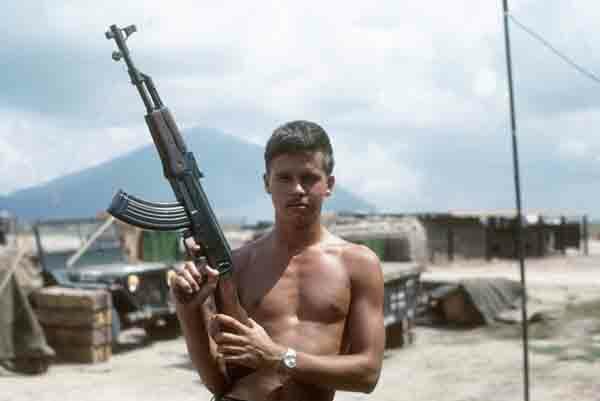 Vic Cooper poses with a captured AK-47, the primary rifle used by our enemy. An AK would operate when stuffed full of mud, while the M-16 could jam from unburned gunpowder particles. An M-16 was machined with close tolerances while the AK’s were so loosely machined that shaking one sounded like a child’s rattle. The AK-47 fired our M-14s 7.76mm ammunition and captured rounds made up a large part of the enemy’s supply. A visitor to this site said I am not correct about our ammo working in an AK-47; this is not my first and only mistake on vietnamsoldier.com. We often borrowed captured arms from infantrymen and used them as props for pictures we sent to friends and family.